Sometimes you need comfort food. Gnocchi with sausage tomato sauce and fresh mozzarella is pure, simple comfort food. Just warm and gooey and good. Kind of a ridiculous description but I can’t come up with a better one. Maybe I’m uninspired tonight but this dish is hit you over the head tasty comfort food. Tang from the tomatoes. Depth from the sausage. Melted cheese. Lots of melted cheese. Warm and gooey and good. It’s like a lasagna you can whip up in just over an hour. And most of that time is unattended. It’s way easier than a lasagna but it’s the same general idea. Tomato sauce. Cheese. Meat. Pasta. All the major food groups in one perfect dish. It’s a simple recipe so you can’t hide bad ingredients. San Marzano tomatoes aren’t 100 percent necessary but they really do add something special. Decent Italian sausage isn’t that to find. And that leaves the cheese. Fresh mozzarella. Again, not hard to find. Even Costco carries it. It also goes by fior di latte. Either way it’s a revelation worth seeking out. Gnocchi with sausage is family food. Food to share with good friends. Food your kids will love. Its for people that value flavour over flash. You can’t plate it in any way that looks good. It’s just a big mess of stringy cheese. Tasty, tasty stringy cheese. If you are serving it at a dinner party cook individual portions in ramekins or other small oven-proof dishes. Serve it up with a nice green salad. That would work nicely. Get you flash and flavour. One thing to note. Gnocchi with sausage isn’t a side dish. These are big tastes. Hit you over the head big. Completely overpower anything you put it up against big. It is either an appetizer (think primi in the Italian way) or a main course. Either way, gnocchi with sausage tomato sauce is going to be a hit. Maybe even a home run. Gnocchi with sausage tomato sauce and fresh mozzarella is just a big mess of absolutely delicious. Sometimes simple is best. Pass the tomatoes and their juices through a food mill or break them up by hand. If you break it up by hand remove the stem cores and any skin. Heat a saucepan large enough to hold the sausage and tomatoes over medium heat. Add enough olive oil to film the bottom of the saucepan. Crumble the sausage into the pan and cook until just done. Remove, using a slotted spoon. Spoon off all but 2 Tbsp of fat. If you don't have 2 Tbsp check the bottom of the bowl you put the cooked sausage into. It's there waiting for you. Turn the heat down to medium low and add the onions. Cook, stirring occasionally, until the onions are soft and translucent. Do not let them brown. Hopefully cooking the sausage left a bit of browned goodness in the bottom of the saucepan. If it did, pour about 2/3 of a cup of the crushed tomatoes into the saucepan, bring to a boil and scrape it up. If you didn't get any browned goodness just add all the tomatoes and next time cook the sausage over higher heat. Return the sausage to the pan. Add any remaining crushed tomato. Simmer for 30 minutes or more. Taste and adjust for salt. It likely won't need much, if any. This depends on how salty your sausage is. This sauce is great with any pasta. Pre-heat your oven to 375. Position the racks so you can move finish this off with the broiler. Cook the gnocchi in boiling, well salted water until they float. Remove them as they come to the surface. Combine the gnocchi with the sausage tomato sauce. Add half the cheese and stir to evenly distribute the cheese. Fold into a 10 inch baking dish. If you are doing this for guests, consider individual serving ramekins. This is messy stuff to plate. Bake until the cheese is melted - about 5-8 minutes. Turn your oven to broil, place the pan high in the oven and broil until the cheese starts to brown. This takes a minute or so, depending on how powerful your broiler is. Let cool about 10 minutes, top with basil and serve. In american, appetizer, italian, main course, meat, pork. Bookmark the permalink. Wow looks fabulous…I make this but never with the hot sausage. Gotta try that next! Haha – I got the start of this from you! The sausage really kicks it up. Haha you always one up me on my Italian cuisine which is all I sort of know. Nicastro sausage I bet would work nicely.. Is that where you get yours? Nicastros, Lucianos, Glebe Meat Market, even Farm Boy… No shortage of decent Italian sausage in town. Oh my gosh, that stretchy melty cheese shot! I am living the life of comfort food right now and I need the flash and flavor. 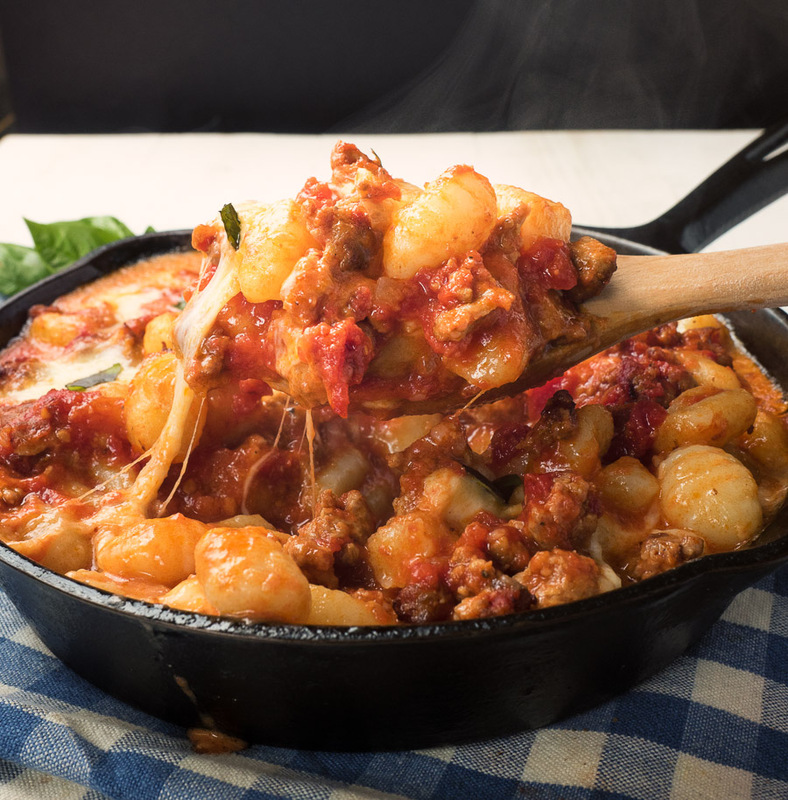 This gnocchi with sausage tomato sauce sounds and looks incredible. 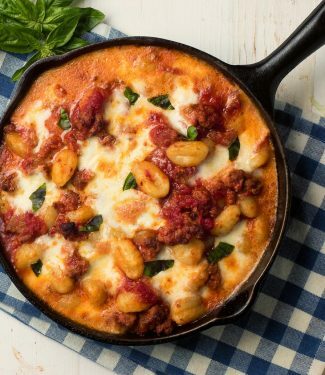 So this one is a keeper- I splurged the $$$$ and bought the San Marzano tomatoes and used Italian Med sausage from Farm Boy and it was a hit in my household. Thx Tina for the ‘pick’ tip for future San Marzano purchases. I’m filing this one way- thx- grazie! The can had the ‘DOP’ designation on it and after a trip to Italy I seek out DOP when possible…I know about the suspect labelling on ‘San Marzano-like’ canned tomatoes. I paid just under $6 for the one precious can- well worth it though as my daughter doesn’t like tomatoes and She loved this. I think the acidity level of San Marzanos might be lower- but she didn’t complain at all! A big hit with the family! Very tasty! This is just straight up comfort food to me! I love that you used San Marzanos and fresh mozarella. Good ingredients make all the difference.